HSE is developing a new online tool to help architects, designers and employers select the most appropriate flooring type for frequently slippery work areas in new or refurbished workplaces. Industry leaders have worked with HSE on the Flooring Selection Tool, which comes in response to possible confusion over current performance data. Manufacturers of workplace flooring provide information on the performance of their product types in a variety of ways, with some defined more comprehensively than others. Also, the data does not take account of changes in slip resistance when the flooring is installed, treated and cleaned. The tool is optional, but is designed to support the risk assessment process when it shows that workplaces are likely to be frequently slippery. According to provisional figures, slips and trips were responsible for more than 40 percent of major injuries to workers in Britain in 2010/11. Each year, these types of injuries cost society in the region of £500 million through things like working days lost, or a drop in productivity. There are various things employers can do to minimise the risk of slips and trips at work. These can include introducing control measures such as suitable footwear, and new cleaning regimes. Employers can also help ‘design out’ some of the risks by considering the suitability of flooring installed in any new build or refurbishment work, or by using effective entrance matting systems to minimise the amount of contamination being brought into buildings from outside areas. Employers must consider the risks that arise in the workplace and then put sensible and proportionate measures in place to minimise the likelihood of them occurring. Under the Workplace (Health, Safety and Welfare) Regulations, 1992, employers must provide floors which are suitable for workers to use safely. Designers and architects also have a duty to ensure that their designs for workplaces meet the requirements in the Workplace Regulations. Selecting appropriate types of flooring for installation in new or refurbished workplaces, which are likely to retain their slip resistance properties when contaminated, can help to minimise the risk of workers and members of the public slipping. However, flooring can lose its slip resistance properties if it is not maintained and treated. The Flooring Selection Tool is based on data generated by the Health and Safety Laboratory (HSL) using the Pendulum test according to the current UK Slip Resistance guidance. It also draws upon HSL’s assessment of installed floorings over several years.. A range of trade associations and individuals have been involved in its development, including representatives from the architect firm Scott Brownrigg and the National Building Specification. The tool works by identifying types of flooring that are likely to retain their slip resistant properties when contaminated with common liquids. The likelihood and frequency of any contamination should be considered as part of the risk assessment. Where a risk assessment shows that flooring is not likely to become frequently contaminated through use, or where suitable control measures can be put in place such as cleaning processes or slip resistant footwear, many types of flooring will be suitable for installation. Floors that are kept clean and dry will nearly always perform well in terms of slip resistance. The tool will prompt users to consider whether their work area will become frequently contaminated with common liquids and products before listing flooring types. 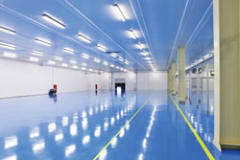 What is a contaminated floor? Most floors only become slippery once they are contaminated. Contamination can be classed as anything that ends up on a floor. For example, liquids such as rainwater, oil or grease, or other products such as cardboard, product wrapping or dust. Contamination can be any by-product of a work process, or the result of weather conditions; for example, liquids spilled in food manufacturing, dust produced in a bakery, or water or snow tracked through entrances on the feet of employees or visitors to a workplace. The likelihood and frequency of any contamination should be considered as part of the risk assessment. The Flooring Selection Tool is based on data generated by the Health and Safety Laboratory (HSL) using the Pendulum test according to the current UK Slip Resistance guidance. It also draws upon HSL’s assessment of installed floorings over several years. HSL carried out pendulum testing on various types of flooring to determine their slip potential in the as-found dry, water-wet and glycerol-contaminated conditions. Where possible, HSL carried out testing on surfaces that had been installed in the last 12 months to account for the influence of installation, maintenance and use, while also ensuring that surfaces were not excessively worn. For a small number of surfaces, researchers carried out additional laboratory testing of pre-installed samples. HSL obtained PTV data for 50 generic types of flooring, and classified each generic type as low, medium or high slip potential for each contaminant used. All results are classified as presenting a high, moderate or low potential for pedestrian slip. The below table shows the three different categories of slip potential. Based on this PTV information and experience of the flooring in use, the tool characterises common flooring types. For further information refer to ‘Assessing the slip resistance of flooring - technical information sheet’ (www.hse.gov.uk/pubns/web/slips01.pdf). The flooring tool is useful when considering refurbishment or design of internal surfaces and walkways, but should not be used for refurbishment or design of external flooring surfaces or walkways. It does not consider installation of flooring on slopes or ramps. Any pedestrian surface to be installed on a slope requires a higher slip resistance than if it were installed on the level. The research behind the tool focuses on common flooring types in common work areas, so some specialist or heavy industry sectors are excluded. Domestic premises are also excluded. Another way to reduce the risk of slipping is to install matting at the entrance to a building. When a UK retailer reviewed its accident data, it found that in one year, 77 people had made personal injury claims as a result of slips at the entrance to one particular store. In order to reduce the risk to customers, it was decided to increase the area of matting used. The length of the entrance mat was doubled, held in place using a new anchoring system that avoided the need for a mat well. As a result, the accident rate at the entrance was dramatically reduced, with only one personal injury claim being made subsequent to the improvements. The main source of wet contamination at entrances is from wet weather. If a floor that is slippery when wet is used in an entrance area, then the entrance matting plays a vital role in helping to stop the floor inside the building becoming wet. Standards for mats have tended to focus on removing dirt and grit from shoes to protect the floor, rather than protecting the user from slip accidents. In the UK, the Entrance Flooring Systems Association (EFSA) has developed a laboratory test method to quantify water removal. In order to validate the method, HSL and EFSA carried out a study of pedestrian flow at entrances and simulated the use of entrance matting in the laboratory. The first phase involved visiting a range of businesses in Preston and Blackpool to identify pedestrian areas with entrance matting systems such as supermarkets, retail premises and offices. Researchers looked at the entrance design, characteristics, mat size, and mat type. They also asked branch managers questions about peak trading times, customer flow rates and the effectiveness of mats. After this, a laboratory experiment measured the water uptake of various mats. This involved a circuit with types of mats and trays of water that volunteers walked around. Researchers weighed the matting tiles and the trays of water (the trays before and after addition of water). Water was also added to a control tray and control mats to measure any evaporation taking place. As volunteers walked around the circuit, they were also asked to shuffle their feet when crossing the cotton mats in order to remove any moisture. After 20 minutes, the trays and matting tiles were reweighed to measure the amount of water lost from the trays, and the water gained by the matting tiles. The volunteers then walked over the matting for another 20 minutes and the weighing procedure was repeated. Peak flow rate - When selecting an entrance mat, it is important to consider the level of traffic coming through the entrance and to identify the key times of day when people enter the building. Length of matting - This study has shown that at low flow rates (78 people per hour), 3-4m is the minimum length of matting required to adequately remove moisture. Width of matting - Test results show that the uptake of water with the footfall was concentrated on a 0.5m width of mat. In a real installation, it is likely that the mat will be wider than this. Type of mat - Of the six mats studied, the fixed textiles performed the best overall. Some mats were more effective in removing all of the water than others, regardless of the water absorbed by the mats themselves. It might be reasonable to expect the pile on the mat to be influential in this area. A mat with a very short pile, or no pile at all, would not reach into the tread pattern to remove the water as well as a mat with a greater depth to the pile. Of course, this effect may also be negated in use if the pile flattens. Heating/air conditioning use - Evaporation rate is an important factor in the performance of entrance mats when subjected to heavy traffic. In the experiment, a similar rate of evaporation occurred for all of the control mats. However, it was noted that the coir mat took the longest to completely dry out after testing at each flow rate. In addition, the fixed textile 1 mat took longer to dry than the fixed textile 2 mat. Entrance design - When designing a building, the entrance should be positioned to minimise the presence of soil and water, creating a situation that is less demanding for the entrance matting system. The type of flooring immediately outside of the entrance and the use of external canopies have been seen to reduce the water, again reducing the demand on the matting system and thereby making slipping accidents less likely. The study aims to give the designer of an entrance to a building food for thought. It gives a clear indication of the likely sizes of matting required to reduce the likelihood of slipping accidents at entrances to commercial buildings. It is intended that the detailed data gathered can be compared with that generated by the EFSA laboratory test, with a view to validating the laboratory test method for inclusion in matting standards. All of the experimental work in this study uses new matting, so the results relate to the mats in the new condition. It is likely that each product will change throughout its lifetime. As with flooring types, regular cleaning and maintenance according to the manufacturer’s instructions will maintain the effectiveness of mats. Finally, it is also important to remember that a suitable and sufficient risk assessment can help to minimise slip risks. This may involve flooring and matting, but can also include a variety of control factors: one solution should not be viewed in isolation.